Watch out for the roar of Trunkisaurus Rex, this suitcase is ready to bite the boredom out of from travel! 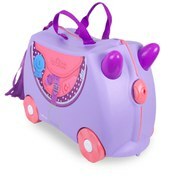 Not only does it have the usual Trunki features, but it also has marbled scales and ferocious teeth! Designed for use as hand luggage, children can pack all their favourite toys inside the cute Trunki, then enjoy whizzing around the terminal. Parents can keep kids in tow with the included carry-tow strap that clips to the front of the suitcase. 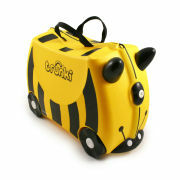 Lightweight and durable, the Trunki complies with most hand luggage regulations. With plenty of space inside, kids can fill it with toys, books, games and spare clothes. 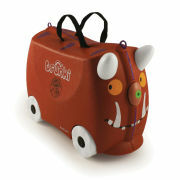 Kids will love to have the Trunki as a travel companion. I ordered the trunkisaurus rex for the grandparents to give as a gift for my sons 5th birthday so its not been used as yet but quality looks good and the price was great! Fast delivery too!